Conveyance in sweets industry has problems due to the sticky surface of most of the products involved. EUROBELT has belt types with special surfaces in order to minimize the adherence between product and belt. Big gooseneck elevating conveyors which feed the weighing-bagging machines should always use modular belts in order to avoid a continuous maintenance of plastic scoops and heavy transmission chains, as well as the productivity loss. 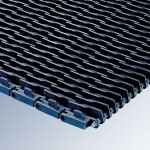 The EUROBELT Flush Grid belts are ideal for cooling these products thanks to their open surface which enables air and refrigerating liquids to pass through it, as well as it makes the cleaning easier.